The picture shows suicide bomber Ayyat Al-Akhras, who murdered 2, wearing a keffiyeh (Arab headdress) and holding a handgun. 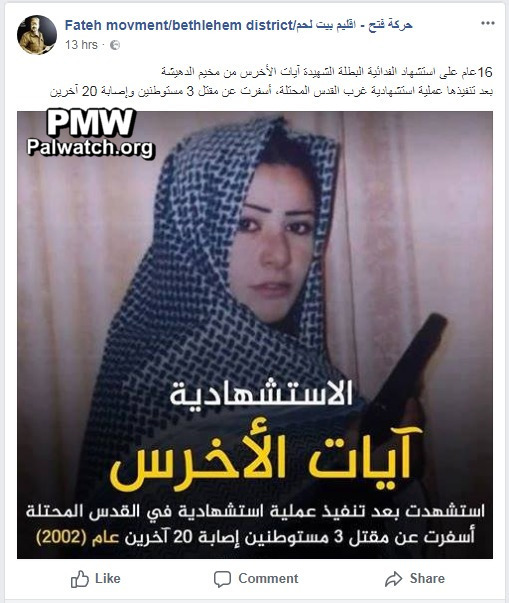 Posted text: "Sixteen years since the death as a Martyr (Shahida) of heroic self-sacrificing fighter (Fida'iya) Martyr Ayyat Al-Akhras from the Deheisheh refugee camp, after she carried out a Martyrdom-seeking operation in occupied West Jerusalem that led to the death of 3 (sic., 2) settlers and the wounding of 20 others (sic., 28)"
Ayyat Al-Akhras - The youngest female Palestinian suicide bomber (aged 17). A member of Fatah, Al-Akhras blew herself up near a Jerusalem supermarket on March 29, 2002, murdering 2 and wounding 28.